Apple cider vinegar is a liquid that is made from crushed, fermented apples that is known for providing various nutrition that can help to lower cholesterol, prevent food poisoning, relieve allergies, provide antioxidants, cure acne, strengthen the immune system, promote weight loss and more. However, in spite of these benefits it can be dangerous. You should talk to your doctor before staring an apple cider vinegar regimen to make sure it will not conflict with any existing health conditions or allergies. The strong acid in apple cider vinegar can irritate the throat and cause it to become sore. Dilute the apple cider vinegar with large portions of water to make it easier to swallow. If you are still having difficulties, contact your doctor for medical assistance. Consuming apple cider vinegar will lower your body’s natural potassium levels. If you are already taking medications that are designed to lower potassium levels, speak to your doctor before adding apple cider vinegar to your regimen. 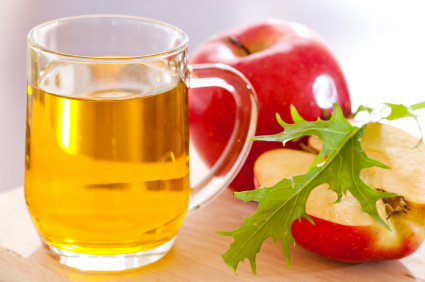 The high acid level in apple cider vinegar can cause your enamel to weaken which can make it difficult to chew. After consuming apple cider vinegar you should rinse your mouth out or sip this mixture with a straw to protect your teeth. After drinking apple cider vinegar you may develop a stomach ache that lasts for over an hour. Mixing the vinegar with a bit of baking soda will balance out the acidity that can help prevent this remedy. Mixing eight ounces of water with two teaspoons apple cider vinegar and a teaspoon baking soda is recommended. Apple cider vinegar is not recommended for those with osteoporosis as it has been known to lower bone density. Before you use apple cider vinegar to detoxify the body, speak to your doctor to ensure that it will not negatively interact with any medications you are using to help manage your bone health. Regularly consuming apple cider vinegar can cause you to feel nauseous for a few hours, though it does not typically lead to vomiting. You should not drink apple cider vinegar on an empty stomach and you may need to vary the time of day in which you drink this substance to determine when it sits well with your system. Apple cider vinegar causes your body to cleanse itself of impurities which can cause acne to appear on the skin as these impurities move out of the skin. This side effect should only last a few weeks. Some have reported that taking apple cider vinegar for a few days has caused itching all over. This may be a sign of an allergy, so it may be necessary to stop using the vinegar until the itching subsides, then return to consuming the vinegar. If the itching returns you should avoid using apple cider vinegar in the future. As your body detoxes it can cause your body to develop a headache after using apple cider vinegar. These headaches should not be severe and will stop after a few weeks. If they continue or become severe, stop using apple cider vinegar. Some have found that using apple cider vinegar has actually helped to cure migraines. Those that plan to use apple cider vinegar as a home remedy should be aware that constantly drinking apple cider vinegar can negatively interact with medications that contain furosemide, bumetanide, chlorthakindone, chlorothiazide, etharcrynic acid or metolazine among others. Those that suffer from diabetes should take caution when using apple cider vinegar because the chromium in this substance can affect insulin levels. Those that are pregnant should also take caution as there has not been adequate study reflecting whether or not it is dangerous for them to use this substance. Nursing mothers should take similar caution as apple cider vinegar can be passed through the breast milk and it may be too strong for your child. People that have been using apple cider vinegar for a long period of time may have a negative reaction to the acid. Constantly consuming apple cider vinegar may begin to corrode the skin or the membranes of your digestive tract.